The first part of the day's post is finishing up a post I started before the wacky hectic schedule that was the ACS conference. 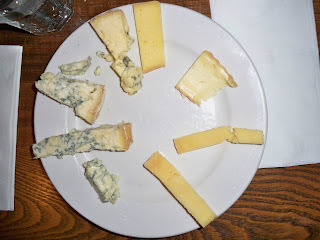 So in this post I was talking about the Neal's Yard Dairy cheese tasting that I went to. We're going to finish up with the blue cheeses. The blue positioned at about 7 o'clock is Strathdon Blue from Scotland. It was my first time every having a Scottish blue and I wish I could say it was fantastic. The flavors were good, salty, milky, moldy, grassy, buttery, but the texture. I couldn't get over it. David, our educator said that this particular wheel was a bit wet and he was right. It tasted to me as if a block of tofu, and a wedge of Stilton got together and had a baby. Not a pleasant texture for a cheese. Great texture for a fermented bean curd. The next two cheeses (going clockwise) are the same, but different. Stilton. The first one we found out after tasting is done with a vegetarian rennet, the second one with a traditional rennet. I preferred the second one. I preferred it for the same reason I prefer raw milk cheeses, it had more flavor. Now, if I'd just tried the vegetarian cheese by itself I would have found it a pleasing cheese. Side by side with the traditional rennet cheese, I found it to be...meh. Rounding out the cheese plate is Stichelton. Lovely, wild, untamed, grassy, ballsy Stichelton. I did a post about this cheese last spring, and in the interest of not repeating myself I'll just tell you to go here to read it. Finally, I would like to send a big ol' shout out to Junglefrog for the lovely treats she sent. We joked that the first package she sent must have been eaten by the folks at customs, and after getting the goody bag, I'm sure they were. 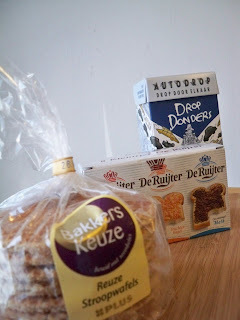 The Drop Donders are little licorice candies in the shapes of cars and a muffler that looks a bit like Emmenthal. The adults enjoyed them. Next up is the box of jimmies. Chocolate, rainbow and chocolate shavings. Soo good. I sprinkled them on ice cream and made the nephew and I very very happy. And then there are the stroopwafels. Imagine a wafer sandwich filled with caramel. Now image going to the coffee shop not S***bucks, never S***bucks and getting your coffee and dunking this in there. Or break it into little bits and mix it into ice cream. Either way is good. Thank you so much for the treats, J.F. Next post: What does 17# of cheese look like and why would I attempt to bring it back from Austin? One of my favorite blue cheeses is Stichelton. From all accounts Stichelton is what Stilton used to taste like back in the day. Before the scare. What was the scare? In 1989 there was an outbreak of food poisoning. The poison: staphylococcus. The suspect: raw milk Stilton. Although the cheese was proven innocent, the Stilton Cheesemaker's Association required that only pasteurized milk be used for making Stilton. In order for a cheese to be called Stilton, it must be made from pasteurized milk. Raw milk tastes milky. I know that sounds silly, but think about it. Milk has flavor. Milk should taste like whatever the animal was eating. Let's say that your cows are grazing on organic fields. You milk them and then make cheese with that milk. That milk and subsequent cheese is going to taste like your cows were outside munching on grass. If the fields were lush and filled with clover you're going to taste that. Now, if you take that same milk and heat it what happens? Well, you lose some of the characteristics of the milk. Heating anything changesflavor profile and it's bacterial makeup, and you're going to taste that in the final product. Don't take my word for it, try it yourself. Get a piece of Stilton and a piece of Stichelton. Try the Stilton first. 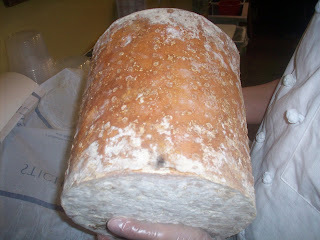 A pastuerized cow's milk cheese. It's a lovely cheese. A very tasty blue. Now try the Stichelton. An organic raw cow's milk cheese. Wow! What a difference! The Stichelton is creamy and buttery and has an absolute mammalian quality to it. It tastes green and sharp and milky and salty and delicious. When people came into the shop I used to do this side by side with them-impossible to do now since we don't carry Stilton. Back to the cheese. 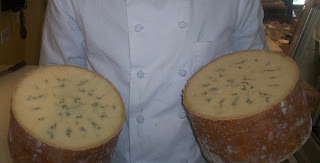 Stichelton is made by Joe Schneider (cheesemaker) on the Welbeck Estate in partnership with Randoph Hodgsen of Neal's Yard Dairy (affinage). Neal's Yard Dairy is the premium affineur in England. They promote small farm made cheeses and have the highest level of quality control. I don't care where you're from, you must know Neal's Yard Dairy, and you must try their cheeses. Why not start with some Stichelton. Mmmm...cheese from "across the pond". Whenever possible, I encourage you guys to do side by side tastings. They're not only fun, but they are educational too. When people come into the shop and ask for Cheddar, I usually pick out three. I get a big daddy cheese like Montgomery's or Keen's from England, an American clothbound cheese like Beechers, or Fiscalini and then a cheese like a one year Grafton Village Cheddar. If you don't taste how do you know? Plus, it's free. You get to taste cheese for free. It's one of the only times I can think of where you get to taste the product before you buy it. Take advantage of it.